The blue rectangles represent game elements that are shared among the players. The luck gauge is common, and the dead man's chest (DMC from now on) mechanic is a kind of contest open to all players. Looking at the diagram you see that the game absolutely wants you to roll! Almost everything leads to rolling more and more, this is what make the game going on(*). 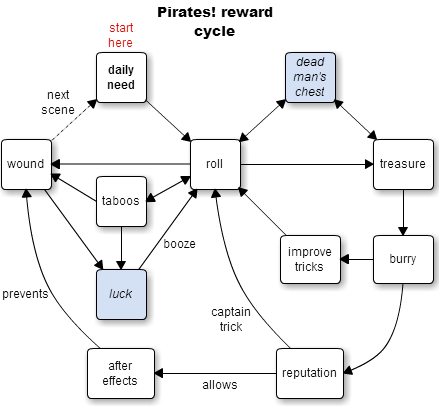 A successful roll means colorful actions (everybody loves them) and rewards, in terms of treasure points and possibly luck. A failure means epic fails (everybody loves them too) and possible loss of luck. Both are meant to give personal and social gratification. The two currencies are obviously treasure points and luck. The first one is personal to each PC, it is used to improve your character. The second one is a shared gauge used to cancel failures and thus play more. Why shared? It is a way to synchronize players: the luck mechanic is here to break the virtuous circle and force the PC to lie down and advance to the next scene (before luck was created, they would dry off a scene until it was dull.) By making it a shared gauge, I make sure all the PC, the new ones or the advanced ones, can perform the same amount of actions in a scene, then move to the next scene together. The daily need is used both to start the game, and possibly to start a new scene, when the virtuous circle isn't started yet. Its reward is available only once per scene, encouraging players to move forward in the fiction. I think the personal and social gratification are colorful actions, stupid decisions (the game is forgiving) and epic fails. And the in-game gratification would be reputation, improving skills, getting some leadership and being able to prevent wounds. Maybe the game is too mechanical and not enough fictional for most players, some of my testers said it's almost a board game. I like it like this, but if I make another game I should try to change this formula. There's no epilogue to the game, you just play until you've achieved high rank and strong skills, which should take around 12 to 15 hours, after what you create a new character or play another game. Did I nail the reward cycle correctly? I hope so, being the designer and all, but sometimes you miss things you created yourself, especially with RPG where mechanics and human behavior mix so closely. (*) With rolling being so important in the game, it had to be simple, that's why it's the most forward, crystal clear rule: roll 1D6 and success if below or equal. Gathering dice, negotiating with the GM and adding several scores would have killed the game. ... the game absolutely wants you to roll! Almost everything leads to rolling more and more, this is what make the game going on(*). A successful roll means colorful actions (everybody loves them) and rewards, in terms of treasure points and possibly luck. A failure means epic fails (everybody loves them too) and possible loss of luck. If the first paragraph is nothing but the Color which you know for sure the game can generate in play (i.e. in encounter with real humans), and if it's followed by the quoted lines above, then the reader is either completely sold on playing, or legitimately uninterested. Which I think are precisely the two reactions you want from the introduction to a game text. I still don't know whether a double arrow is needed or not between luck and roll. A low luck might make the player roll, but a daily need might also want him to successfully roll booze, with the side effect of making him earn a luck point. Anyway, the main thing is here I guess. The subject is named "reward cycle" but, as soon as you try to make a diagram out of a reward system, it seems that you need to represent the complete game system so I might as well have called the diagram that. Now I'm trying to draw diagrams on my other projects and it is very helpful! Ron, I can't change the game text because the book is already available on print-on-demand and I don't want to change it anymore, but I shall follow you suggestion and put it on the game's website! You've raised a great point about the time-scale of motivation, which has always been a topic of contention within my concept of Reward. The odd thing about many games written in the past ten years is that short-term satisfaction has been privileged quite strongly, usually in the form of currency exchanges like yours in Pirates!. Unfortunately this led at least some of the independent-favoring, experimental play culture to abandon long-form play, once they discover games which strongly favor or even enforce endings. A number of designers have tried to find a way to favor long-form play in addition to short-term fun, and been frustrated by an audience that simply doesn't want to stick with anything to discover those longer reward cycles, probably due to past history, and is typically satisfied in the short-term and ceases to play. Or worse, rushes play - in my experience, My Life with Master plays better over several sessions, rather than jam-packed into one, but all too often, people do play it in a single session. With The Clay that Woke, although play features massive in-the-moment colorful experience as the short-term and immediate satisfaction, Paul is really shooting for a long-term, emergent experience. I do quite like that "no-story" play concept. More of that might be a lot of fun.